THE ADDRESS is an elegant lifestyle and luxury real estate publication celebrating the best of architecture and interior design throughout the world. From the gracious homes of Andalucia to the high-end resort communities of Vietnam, the glossy digital magazine combines inspiring imagery, informative features and tactile experiences of some of the world’s finest properties for sale. Since 2008, THE ADDRESS Magazine has attracted a sophisticated global audience and has today subscribers in more than 100 countries. As an authoritative and captivating resource, the magazine captures the interest and attention of some of the world’s most coveted consumers. Just a short note to thank you for all you have done for me in placing our property in the market. The property has now been sold, and it is worth noting that, notwithstanding the use also of “Major” real estate brokers of the World, it was your advert (and wonderful script) that finally introduced us to the eventual purchaser. A Royal family from the Middle East. Each issue provide unique and comprehensive content and reader experiences. That way THE ADDRESS Magazine has become a sourcebook trusted by our readers and a guide for what to buy and where to invest. 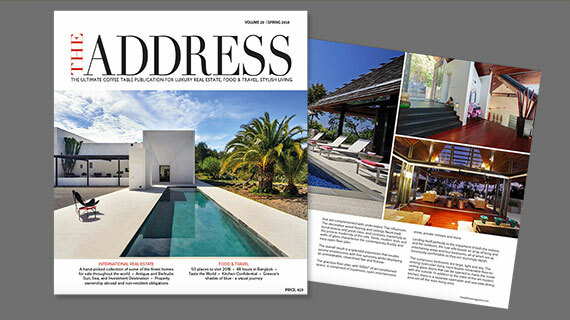 Contact THE ADDRESS to find out how your properties can be featured in the magazine. In co-operation with our editor, advertisers in THE ADDRESS benefits from stories created with a distinct perspective complemented by great photography. If you want to advertise and tell the story about your properties in THE ADDRESS Magazine, please do get in touch.